Alisson reminded all of his value as a sweeper keeper to turn defence into attack in an instant during Liverpool’s clash with Leicester. The Brazilian endured a mixed first-half at Anfield, with Jamie Vardy coming close to catching him dawdling with the ball at his feet. 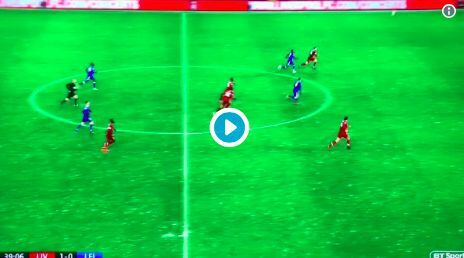 This followed a misplaced pass to Jordan Henderson that almost supplied James Maddison with a clear route to goal on the right-hand side of the Liverpool box. Nonetheless, the Reds shot-stopper still managed to play crowd-pleaser as he burst from his line to intercept a Leicester long-ball, before feeding the run of Mohamed Salah in the channel and forcing Ben Chilwell into conceding a cheap throw-in. The sides entered the interval with a goal apiece after Sadio Mane’s early opener was cancelled out by Harry Maguire’s close-range leveller on the stroke of half-time. LFC 1-1 LCFC, 55 mins gone.